Howdy readers, Lafe here. About once a month, my partner in crime, Rich Seeley, has been doing technical takeovers of this blog. Here's his latest post, which takes a look at Visual Studio reporting. So the company you are coding for wants a nice report showing how sales of their line of jeans featuring simulated motor oil and grease stains are selling in various markets. All the information they want is stored somewhere in the sales database. It's just a matter of getting all the names and numbers to line up right so the sales reps, managers, and executives can see how they're doing. Is this a job for a Visual Studio developer? The answer is a definitive yes and no. A Google search on "visual studio reporting" indicates that yes it can be done but no there isn't very much information on how to do it. Paging through some Visual Studio how-to after-market books draws a blank when looking for guidance on generating reports. So you might conclude that report generation is not a popular task with Visual Studio developers. It is possible that sales assistants using something like good old Crystal Reports are doing this kind of thing. It's possible. However, a quick check of Wikipedia tells you: "Crystal Reports became integrated with Visual Studio versions prior to 2010. Crystal Reports competes with several products in the Microsoft market, such as SQL Server Reporting Services, XtraReports, ActiveReports and List & Label. Users can also access Crystal Reports from outside of Microsoft environments; this allows (for instance) Java developers to build applications with Crystal Reports components." Tools and extensions are out there for building applications with reporting capabilities. If you are not an expert in putting reporting capabilities into a sales app there are places on the web where you can get some guidance. The Visual Studio Marketplace offers Progress Software's Telerik Visual Studio Report Designer. It is described as "a lightweight reporting solution for all .NET cloud, web, and desktop platforms which targets developers and end-users alike. Rich interactive and reusable reports can be quickly created in Visual Studio …"
Progress offers detailed instructions for using Telerik, which includes a Report Wizard that might be helpful for those of us in the Sorcerer’s Apprentice category. The latest version of Microsoft’s own Microsoft RDL report designer, projects and wizards for creating professional reports with Visual Studio 2017 has garnered more than 86,464 installs on the Microsoft Reporting Services Project page in the Visual Studio Marketplace. "This package provides support for the .rptproj type and is designed for the most recent versions of Microsoft Reporting Services," Microsoft explained on the download page. "This included the Report Designer authoring environment, where you can open, modify, preview, save, and deploy Reporting Services paginated report definitions, shared data sources, shared datasets, and report parts." In the comments section, a few users reported problems with the install but it seemed to be isolated instances. And it figures that the users who downloaded and had no trouble are unlikely to go back to the page and write a glowing comment. There was also a complaint that the SQL Server Data Tools (SSDT) for Visual Studio 2017 stand-alone download were not yet available when Visual Studio 2017 launched. But on a recent MSDN blog, it was noted that SSDT would be available in the "near future." "The good news," writes Christian Wade of Microsoft, "is that the installation packages for the preview versions of SQL Server Analysis Services and SQL Server Reporting Services project types are already available as Visual Studio Deployment (VSIX) packages." If you're a fast learner and like to watch the Visual Studio screen as some else builds an app, there are some videos on YouTube. Some of the videos appear a little sketchy and are not generally up to Microsoft production standards. Some have gotten mixed reviews. You can search and see for yourself. One that seemed like a pretty good if brief introduction to building a basic sales report is "Microsoft Visual Studio Report Building - Build a Simple Sales Report". For those who like to actually see procedures used in setting up and generating reports there are sources with code examples. This particular URL is asking for the CustomerSales and passing a customerId of A123 as a parameter to the report. Because the URL includes the rs:Format=PDF option, the user will be given the opportunity to download the report as a file (other rs:Format options include Word and Excel); omitting the rs:Format option causes the report to be displayed as an HTML page. Peter offers what the editors say is "all the solutions he can think of" and if you are looking for solutions the article is worth a read. 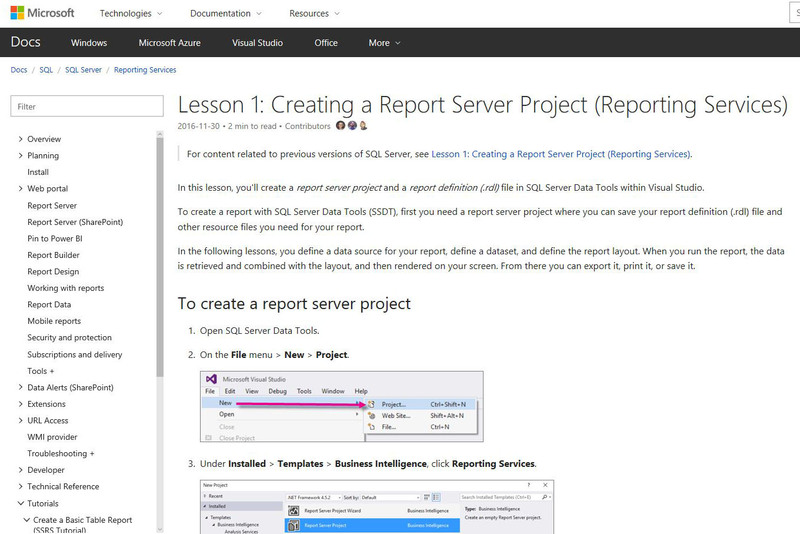 Lesson 1: Creating a Report Server Project: Shows you how to create a report server project and a report definition (.rdl) file in SQL Server Data Tools within Visual Studio. Lesson 2: Specifying Connection Information: Learn "to define a data source, which is the connection information the report uses to access data from either a relational database, multidimensional database, or another source." Lesson 3: Defining a Dataset for the Table Report: Takes you from defining the data source to defining a dataset. "In Reporting Services, data that you use in reports is contained in a dataset. A dataset includes a pointer to a data source and a query to be used by the report, as well as calculated fields and variables." Lesson 4: Adding a Table to the Report: This is where you get to design the report. "You create a report layout by dragging and dropping data regions, text boxes, images, and other items that you want to include in your report to the design surface." Lesson 5: Formatting a Report: "Now that you've added a data region and some fields to the Sales Orders report, you can format the date and currency fields and the column headers." Lesson 6: Adding Grouping and Totals: Here you finish up organizing and summarizing your data. Once you have gone through these simple lessons, you should be able to pass yourself off as a reports guru. But if not, you might consider attending Visual Studio Live! You could talk to one of our certified gurus and get specific guidance on your Visual Studio reporting projects. If you missed our most recent Visual Studio Live! Washington, D.C. preview webcast on Tuesday, May 9, fear not. You can always log on and listen in here. Or even if you did attend this webcast, you can always listen again to review what was covered. Ben Hoelting gave us a free preview of his sessions coming up at the Washington, D.C. event on June 12-15. His webcast was entitled "Web Dev with MVVM and Aurelia: #VSLive Washington, D.C. Preview." Moving on to discuss his next session, "Tools for Modern Web Development," Ben explains why ASP.NET is more openly and completely embracing open source; talk about tools like NPM, Bower, Gulp, Webpack and Yeoman; and describe some of the best practices for using these tools. During the webcast, he spoke about some of his favorite tools and how he uses them. He advises you pay attention to the constantly shifting landscape of these modern web development tools. "Some of these tools change daily, very rapidly," he says. And it's not just the tools themselves, but all the other components. "Also different frameworks have adopted different types of this technology." SQL Server can be a complex beast to tame. Thankfully, there are numerous tutorials covering all aspects of managing and developing for SQL Server. So if you need to brush up on any aspect of SQL Server development, there’s a wealth of how-to on any of these tutorial sites. Designing Solutions for SQL Server: This course will help you prepare for the Exam 70-465: Designing Database Solutions for Microsoft SQL Server. The tutorial covers managing SQL Server environments, database security, backup and recovery solutions, high availability, troubleshooting, and maintenance. Implementing Data Models and Reports: This course is geared for those developing business intelligence (BI) solutions. Some of the BI specific topics covered include multidimensional data models, implementing OLAP cubes, and creating information displays for better BI. The course also gives you plenty of tips for using Data Quality Services, and how to use Microsoft SQL Server 2012 to create reliable Business Intelligence Semantic Models using SQL Server Analysis Services. SQL Server Analysis Services (SSAS) Administration Tutorial: This tutorial covers managing a SSAS instance or database, and points out how it can be similar to managing SQL Server Database Engine. It also covers some of the unique SSAS aspects like processing dimensions, facts and cubes. SQL Server Data Mining Tutorial: This tutorial explains using the data mining capabilities of SQL server for things like prediction and forecasting. SQL Server Master Data Services Tutorial: This one covers Master Data Services (MDS) —the master data management solution from the Microsoft Business Intelligence technology stack. This tutorial helps point out how the SQL Server MDS architecture facilitates master data management, installing and configuring MDS, and some fundamental MDS concepts and terminology. Relational Database Concepts for SQL Server: This tutorial (first of a series) describes general use of Microsoft's SQL Server database management system (DBMS), reviewing database concepts and terminology. Modifying SQL Server Tables: This tutorial (ninth of a series) describes how you can use T-SQL to change database tables. It shows you how to add, remove and modify columns, and explains the impact these this has on existing data. SQL Server Primary Keys: This tutorial (tenth of a series) explains using and creating primary keys—a column or group of columns within a database table that provides a unique reference for each row added to that table. Howdy readers, Lafe here. About once a month, my partner in crime, Rich Seeley, has been doing technical takeovers of this blog. Here's his latest post, which looks at a few Visual Studio unit testing examples. Unit tests are not universally popular among developers and not everyone uses them. But those who use the method seem to love the process. "Unit tests allow you to make big changes to code quickly," writes one fan on a blog refuting unit test skeptics. "You know it works now because you've run the tests, when you make the changes you need to make, you need to get the tests working again. This saves hours." Assuming you are not a total skeptic and at least want to get your feet wet with Visual Studio unit testing, there are resources to help developers step into the waters. For users of Visual Studio 2005 through 2017, Microsoft offers a Walkthrough for Creating and Running Unit Tests for Managed Code, which promises to "step you through creating, running, and customizing a series of unit tests using the Microsoft unit test framework for managed code and the Visual Studio Test Explorer." You start with a C# project that is under development, create tests that exercise its code, run the tests, and examine the results. Then you can change your project code and re-run the tests. The goal of unit testing is improving code. Optimistically, the walkthrough concludes: "the work that we did improving our test code led to more robust and informative test methods. But more importantly, the extra analysis also led to better code in our project under test." If you want to see before you do, there are, of course, YouTube videos that will help you get started with Visual Studio unit testing. Live Unit Testing in Visual Studio 2017 is a Microsoft video with Joe Morris, Visual Studio program manager introducing you to the latest unit test features. He explains that the real-time feedback helps developers be more productive even if they are thrown into a project that they may not have worked on before. "Imagine you’re fixing a bug in a code base with which you’re not completely familiar. With Live Unit Testing you can know right away as you’re typing code that you’re not breaking any parts of the system,” Morris explains. “Getting this feedback right in the code editor as you type will give you extra confidence and make you more productive." Morris goes on to explain that with Visual Studio 2017, LUT is "just a click away." From the top level menu bar, you go to test command and click start. But you have control of when live unit testing runs, so you are not stuck with it finding errors in cases where you are refactoring and know the code is broken. A drop down menu gives you options to pause or stop testing, and, of course, restart when you are ready. LUT gives you icons in the left column of your screen so you see exactly which lines of code are passing or failing. A green check means the line is passing. A red x tells you a line is failing. If no test applies to a line of code, it gets a blue dash. When you make a change to a line of code, a little clock icon appears in the left column to tell you LUT is running for that line, so you know it is working. When the test is complete, the familiar green check or red x lets you know the result. The test took seconds in the demo. Of course, your results may vary. To find out exactly what test or tests the code is failing, you can hover over the red x and a pop-up will show you the test it has failed. Since multiple tests may apply, those that the code is passing will have the green checkmark. You can dive deeper into the failed test to find out what is going wrong to help you with debugging. This can be done without pausing or stopping LUT, which will run in the background. When working on code for a number of projects, another option in LUT lets you specify just the project you want to test, which speeds up the testing process. Boosting developer productivity by reducing manual steps for testing was the key feature Morris touted in his demonstration of Visual Studio LUT. Unfortunately, this is not yet available for all Visual Studio users. On the video, Microsoft notes: "Live Unit Testing is present in the Enterprise edition of Visual Studio 2017 and it's available for C# and VB projects that target the .NET Framework." One viewer of the video complained that it is not available in the Community Edition. Hopefully, the Visual Studio folks at Microsoft will hear his plea. Developers are developers. Designers are designers. It reminds me of the quote, "East is East and West is West, and never the twain shall meet," from Rudyard Kipling's poem The Ballad of East and West. While that is indeed true with compass points, you can't develop websites without an eye to design. If a site looks clunky or is tough to navigate, no one will go there. I once again turn to the blogosphere to see what I can find. Boxes and Arrows is a compendium of articles and posts around the subjects of design and development. In "Make the Commercial First," Steve Turbek writes, "If an app launches in the app store, and no one hears it, did it really launch? Today, digital products like apps and sites require marketing. Luckily, this has become easier to do, even a limited budget." Other stories in the Boxes and Arrows quiver include "Designing Progressive Web Applications for the Future" by Mark Pedersen, "How to Avoid UX Burnout" by Benjamin Earl Evans, and "Benchmark Your UX at All Costs" by Ben Rogers. And finally—at least for now—no discussion about UX/UI would be complete without mentioning the one and only Billy Hollis. 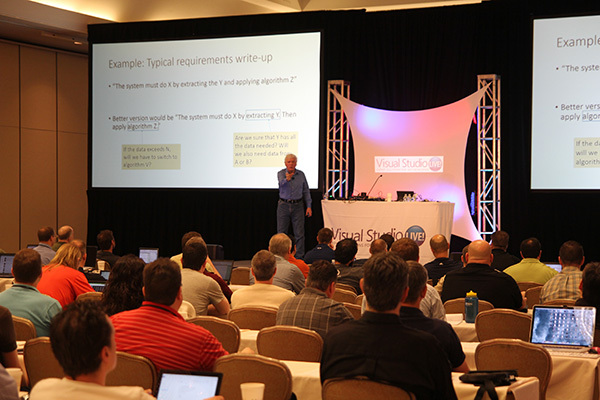 Many of you have probably caught one of his engaging and entertaining Visual Studio Live! presentations. He's a regular, and with good reason. He knows his stuff and his delivery is right on. Billy posts a blog on the official site for his company Next Version Systems. 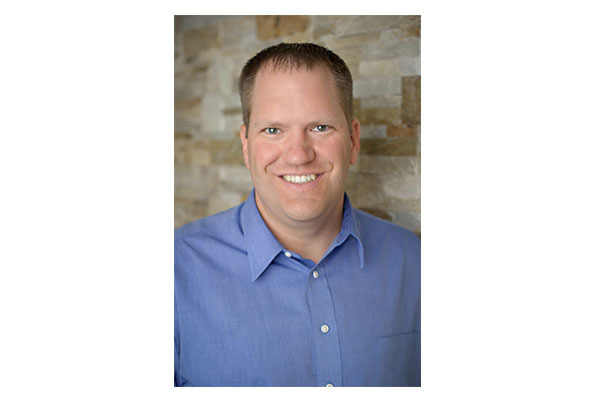 His recent posts include a whitepaper on XAML application navigation shells, Developer on Fire–User Focus, and one of Billy's latest Channel 9 videos. So if you find yourself struggling with UX/UI issues as you're developing your next site, there is help out there. You just have to know where to look. What are your favorite UX/UI design blogs? Let me know at llow@1105media.com! Howdy readers, Lafe here. About once a month, my partner in crime, Rich Seeley, has been doing technical takeovers of this blog. Here's his latest post, looking at some of the themes available for Visual Studio. Everybody wants a nice work environment. One that is suited to their tastes and temperament and helps them feel positive about their job. For developers working with Visual Studio, you can change your work environment, or at least, the Integrated Development Environment, with themes. The basic idea is you may not be happy looking at what Microsoft delivers out of the box. "If you're unhappy with the stark white-on-black of the editor window, you can select a new theme from File | Preferences | Color Theme...for example,...Light (Visual Studio) theme," explained Peter Vogel, in a Visual Studio Magazine article, A First Look at Visual Studio Code. If you are new to Visual Studio or have not messed around with themes, Microsoft Developer Network (MSDN) explains it as: "Themes consist of several supporting files, including style sheets for page appearance, control skins to decorate server controls, and any other supporting images or files that make up the theme." Another Microsoft site, which also has tips on working with themes, explains it in a little more straightforward manner: Themes allow "users to customize the color palette used for menus, toolbars, tabs, title bars, and other environment colors." 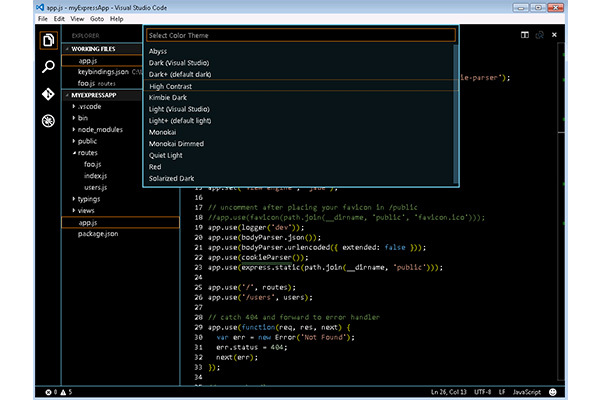 Basically, it lets you customize what you see in the IDE. Not all themes are decorative. Some are about accessibility. For developers with visual impairments, the Visual Studio Code site Accessibility page notes: "Visual Studio Code has many features to help make the editor accessible to all users. Zoom and High Contrast colors improve editor visibility, keyboard-only navigation allows use without a mouse and the editor has been optimized for screen readers." There are instructions on that page for activating a "High Contrast color theme," that would be helpful for the visually impaired. There are a wide range of themes out on the Web. If you look here, you'll find a "Dark Theme," a "Jedi Theme," and even a light Earth tone "Humane Theme." If you prefer a video demonstration of setting colors etc., you can find many on YouTube including How To Import Custom Themes Into Visual Studio, which shows off a Facebook Theme that uses the color scheme of the popular social media site. It also offers a warning that trying to mix and match multiple themes may result in errors. So you may run into trouble trying to combine the Jedi Theme with the Humane Theme. The Visual Studio Programmer Themes Gallery shows off 12 themes. On that page blog author, Scott Hanselman, tells readers why he thinks themes make a difference: "More and more I find myself skinning and theming my Visual Studio development environment in order to stay frosty. It's surprising how changing your theme (fonts, colors, etc.) can re-energize me when I'm having trouble with some problem or motivation." The reference to skinning refers to another way you can make your Visual Studio environment more colorful and helpful. As this MSDN post, Customizing Skins, explains: "A skin is a graphic that surrounds the rectangular form, the viewport, of an application in the Device Emulator or Visual Studio Designer. When you use a skin during application development, you can better visualize how your application looks on a real device. You can use the same skins in Visual Studio designers and the Device Emulator." If you need tips on skinning you can find it there. 2017 Themes – Are We There Yet? Most of the themes and tips for using them refer to Visual Studio 2015 or even earlier versions. There seems to be a reason for that and it may put at least a temporary crimp in your attempt to prettify Visual Studio 2017 if you’ve started working with it. There's a discussion about the Visual Studio 2017 Color Theme Editor on a Stack Overflow community site that indicates developers are having trouble transferring their favorite Visual Studio 2015 themes to the newly released version. One member asked: "I used Visual Studio 2015 Color Theme Editor and now I would like to use this extension for Visual Studio 2017. On the other hand, according to The Visual Studio Blog, it has not been updated yet. So, I am wondering if it is possible to use this extension for Visual Studio 2017 by modifying the previous one until the new Color Theme Editor is released." The answer from several other community members was a definite maybe. One said that the there is a hacked version that lets you use the 2015 themes in the 2017 version. But this is one of those "use at your own risk" deals. Another writes of problems: "The colors in the VS15 themes [do] not exactly match VS17. For example, binary operators are all black in all non-standard themes of the Theme Editor." Sooner or later (some developers say "much later") this will all be sorted out, so that everybody can have the theme they want. Technology continues to change at a dizzying pace. While that is of course true, it's also practically a cliché. What also changes, and indeed more significantly, are the development practices that go along with those technological advancements. Application Lifecycle Management (ALM), agile, DevOps—those have all evolved along the way as well. ALM has been around long enough so there are some venerable references, should you feel the need to beef up your collection of ALM books. If you're thinking of adding a few titles to your development bookshelf, here’s a look at a few ALM books you might want to consider. This polished, practical and comprehensive title focuses on agile ALM, encompassing all the essential principles of agile development. The book provides practical advice and strategies for carefully and thoughtfully implementing agile ALM. Examples and guidance in the book show how to fully leverage the benefits of agile without sacrificing any aspects of your current development processes. You'll learn how to properly manage source code, builds, environments, change control, and releases—all within the structure of agile ALM. You'll also learn how to support agile development within a variety of different organizational structures, whether those groups use traditional development practices, conventional ALM systems, or even non-Agile teams. The book will also guide you through the process of scaling Agile ALM to accommodate larger teams or even remote teams. While slightly dated and geared toward Visual Studio 2013, this remains a comprehensive and high-level text. 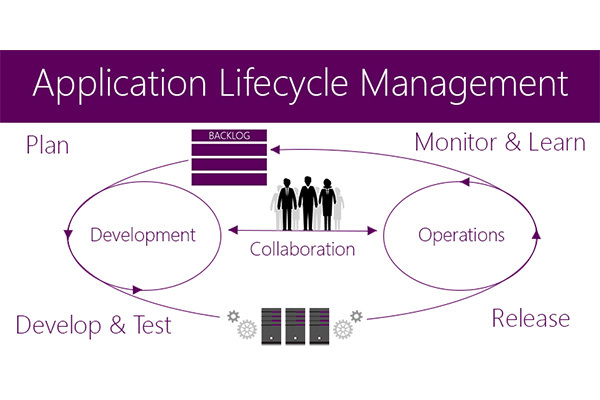 Professional Application Lifecycle Management with Visual Studio 2013 provides in-depth coverage and a complete framework for using Application Lifecycle Management (ALM) to streamline software design and deployment processes with Visual Studio. Naturally, the focus is on using Microsoft's well-developed tools and methodologies. Hopefully, the authors and Microsoft see enough promise in the subject matter to produce a new edition to cover Visual Studio 2017. This book takes ALM a step further and focuses on continuous delivery; specifically Continuous Delivery practices using Visual Studio and TFS 2015. The authors Mathias Olausson and Jakob Ehn are both Microsoft MVPs. They adroitly present the theories behind this methodology and how to best use it in practical environments using real-world examples. Stay tuned for future blog posts featuring TFS and VSTS books! Know of any more great ALM books? Drop me a line at llow@1105media.com. If you’re developing apps or services for the web, you’re bound to be using ASP.NET. This language framework is one of Microsoft’s gifts to the development world for building dynamic web sites, apps and services. It has been around since early 2002. It actually succeeded Microsoft's Active Server Pages (hence the ASP in ASP.NET) technology. And now there’s ASP.NET's successor ASP.NET Core. The Core version is built around a new open-source, cross-platform .NET compiler. Codenamed “Roslyn” when it was under development, it was often jokingly referred to as the “worst kept secret at Microsoft,” since they didn’t seemed as concerned about secrecy as they often do when new releases are in the works. This is the official Microsoft ASP.NET Core tutorial site. It covers broad categories like building web applications, building web APIs, working with data, authentication and authorization, client-side development, testing, publishing and deployment. These ASP.NET Core tutorials do a good job of taking you right from the start. Under the building web apps category, for example, there are tutorial segments for Your first ASP.NET Core application on a Mac or Linux using Visual Studio Code, Building your first ASP.NET Core MVC app with Visual Studio, and Getting started with ASP.NET Core and Entity Framework Core using Visual Studio. And in the next category, building Web APIs, there are segments on Building your first web API with ASP.NET Core MVC and Visual Studio, ASP.NET Web API Help Pages using Swagger and Creating backend web services for native mobile applications. This one is part of Tutorialspoint, which also covers the original version of ASP.NET. These are very much first-timer oriented. The ASP.NET Core tutorials cover an overview, environment setup, new project, project layout, exceptions, set up MVC, MVC design patterns, routing, action results, and a handful of other topics. The regular ASP.NET section they describe as basic ASP.NET programming will bring you to a moderate level of expertise in ASP.NET. The site recommends starting with an understanding of the .NET programming language and other web technologies such as HTML, CSS, and AJAX. The ASP.NET tutorials cover environment, life cycle, event handling, server side and server controls, client side, directors, validators, file uploading, multi views, AJAX control, data sources, data binding, and debugging. There’s a whole list of other specific topics as well. These pretty much cover all the ins and outs of ASP.NET and ASP.NET Core. Once you’re rolling with ASP.NET and want to branch out to Core, check this one out. This covers the latest and greatest in the latest version. The site recommends, "You basically need to update your project.json file, targeting the version 1.1 of the framework and the NuGet packages. If you are using VS 2015, you might also need to update or create a global.json file that pins the target framework to be used with your project, in case you run into issues with multiple versions installed locally side by side." Add middleware (your own or third party provided) to particular controllers or actions. For example, you could add the new compression middleware only to particular actions. Use Route features like the RouteData values extracted by the routing middleware. The first option means greater flexibility. The second might not seem much, but it makes a great difference in some scenarios." It follows up each topic with code snippets to demonstrate how to do what the tutorial has just explained. There are other ASP.NET and ASP.NET Core tutorials out there, but these were some that rose to the top, in my humble opinion. Let me know what you think at llow@1105media.com. Howdy readers, Lafe here. About once a month, my partner in crime, Rich Seeley, will be doing technical takeovers of this blog. Here's his look at some of the new features in Visual Studio 2017. Microsoft filled hours of YouTube space this month with the launch of Visual Studio 2017 including this kickoff by Microsoft CEO Satya Nadella, who touted the release as designed to empower developers to build any app on any platform. "We can’t wait to see what developers do with it," he said. Once you get past the all-things-for-all developers hoopla, there are some cool cutting-edge features in this Visual Studio update. Not surprisingly, some of the demos that got the most applause from developers at the launch event were automations that speed up coding and debugging. As a Visual Studio Magazine article pointed out in covering this month’s launch "much of what's new has to do with updates to tools that aim to increase developer productivity and performance and the current state of several VS iterations, including the Mac and Mobile Center previews...improvements to startup (new Start page) and project loading (also, project loading without the need to have a solution loaded); enhanced navigation, with a host of Go To shortcut keys for grouping, sorting, filtering and searching of references in a Results window; IntelliSense filtering; improved refactoring, style analyzers, and other C# language improvements; support for CMake and Linux (via extension) in Visual C++; live unit testing; new Run to Click in lieu of temporary breakpoints and exception helpers in a non-modal dialog for debugging; and a new, streamlined installer." As Michael Domingo pointed out in this Visual Studio Magazine post, getting an overview of what’s new in the Visual Studio update can be difficult with so many features being touted in the two-day launch event. But he pointed readers to a poster created by the VS team at Microsoft to show all the new features including Advanced IntelliSense, Live Code Analysis, new shortcut keys for faster development, links to pages for extensions, and a mini-graphic of the many layers of .NET, and language-specific changes. When you spot the new goodies that apply to your work, you can dive into the release notes to get the details. Visual Studio IDE - A broad range of enhancements in Visual Studio 2017, including reduction in startup and solution load times, sign in and identity improvements, improved code navigation, open folder view, and connected services to enable connections between your app and any service on-premises or in the cloud. Debugging and Diagnostics - Overhaul of the Exception Helper and faster code navigation with Run to Click. Plus, a new summary of your application events in the Diagnostic Tools window and several improvements to the CPU Tool. Live Unit Testing - Visualize unit testing results and code coverage live in the editor. Testing Tools - Associate automation with test case work items using the Test Explorer. ByRef return consumption extends the language to support consumption of functions and properties from libraries which have ByRef returns. As a reminder that any software release is more of a work in progress than a final product, an article on the Visual Studio magazine website, points to this irony: "Even with Team Foundation Server 2017 now out with the release of Visual Studio 2017, the VS team continues to work on TFS 2015 improvements. Just last week, the group released a TFS 2015 Update 4 preview that rolls up with a slew of bug fixes." So enjoy the Visual Studio 2017 update. And stay tuned. Visual Studio Magazine Editor-in-Chief Michael Domingo found this Visual Studio 2017 infographic helpful, and we hope you will too! Microsoft added a ton of new features and updated functionality to Visual Studio 2017. There is also a lot of partner technology now incorporated directly into the IDE, like Redgate’s database features and Parasoft’s integrated unit testing. There has been a lot going on in the development pipeline throughout the last year since Build 2016. It’s a lot to keep track of, so having a summarized list of all Visual Studio 2017’s new and updated features—both the standard features you use every day, and some unique hidden gems—can help keep you on track. 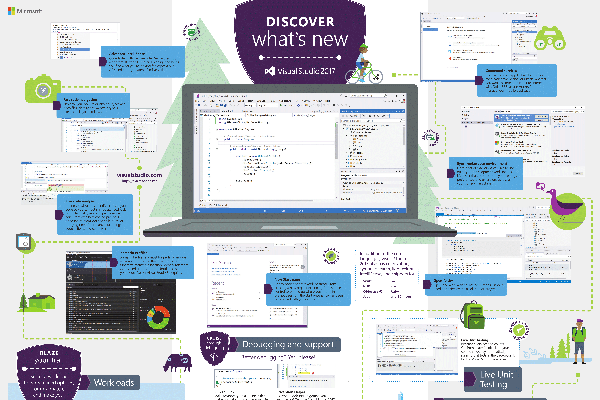 So that's what the Visual Studio team did, put all of those goodies and hidden gems into an infographic posted on their site and ready for printing. Besides some quick tips on Advanced IntelliSense, Live Code Analysis, and a whole host of new shortcut keys for every facet of development, there are also links to pages for extensions, a nifty mini-graphic of the many layers of .NET, and language-specific changes, all depicted graphically. If you end up printing this up and posting it, we'd love for you to send photos of you with the wall you tape this poster on. Tell me about it at mdomingo@1105media.com.